AWTT INC. Armor Balls® AQUA shade ball cover systems offer a simple and maintenance free solution to reduce heat loss, evaporation, algae growth and odors. The Armor Ball® AQUA ball cover is constructed of polyethylene and is 100mm (4 inches) in diameter, with a weight ranging from 120g to 275g (depending on the application). 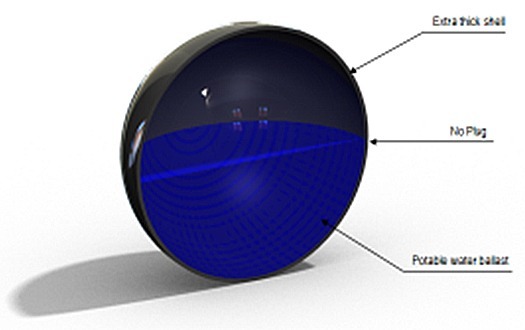 The sturdy construction combined with the ballasting element inside the ball allow each element to float with about 30% to 50% of the ball submerge, making the cover wind resistant and preventing the balls from being blown out of the pond. Its sturdy construction ensure it is very durable, totally maintenance free, with airtight seals to contain the ballasting material (proprietary manufacturing techniques are used). Special HDPE formulation and ultraviolet stabilizers protect from the degrading effect of sunlight. The Armor Balls® AQUA ball cover barrier, contrary to standard covers, does not represent an obstacle to static, moving or dipping equipment. The balls can be easily pushed aside and the cover reforms itself as the basin and obstacles change configuration, as in a clarifier. In fact, the balls will keep up with liquid level, rising, lowering and restacking themselves as needed. Armor Balls® AQUA ball cover is also an effective wildlife deterrent. When entirely covered, the body of water becomes unattractive to waterfowl and other wildlife such as deer. They simply don’t recognize it as water. Compared to netting, Armor Balls covers are not sensitive to ice or snow damage and do not require any kind of support. Deters waterfowl from landing on covered waters. Each ball floats with about 30% (160g) -50% (275g) of the ball surface submerged, preventing the ball from blowing out of the basin. Reduces penetration of UV rays: prohibits growth of algae and clogging weeds. Aeration can be installed underneath the Armor Balls® system to ensure aerobic conditions are maintained. 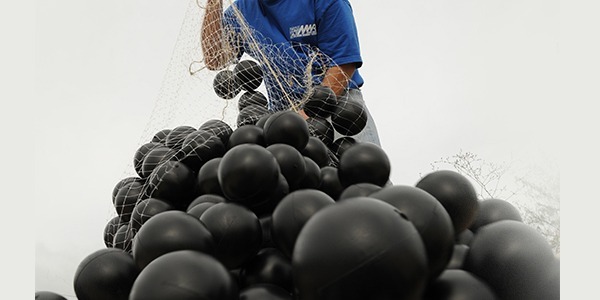 Armor Ball® AQUA 275 is made of virgin or recycled, high density polyethylene HDPE. Armor Balls® AQUA(160‐275) are widely used for all external applications due to their particular resistance to freezing and high wind conditions. The degrading effects of sunlight are prevented with UV stabilizing additives. HDPE is recommended for most applications including demineralized water and Chromic acid applications. FDA (3) and NSF approved HDPE resins available for special applications.